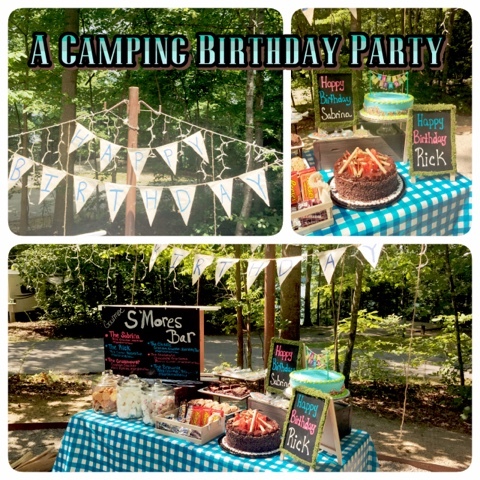 A few weeks ago I had the pleasure to host a dual camping birthday party. I rented a campsite for a weekend getaway. The camping trip was my husbands birthday present. 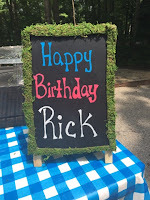 But the birthday party was for my sister-n-law and my husband. I can't believe their birthdays fall on the same day. 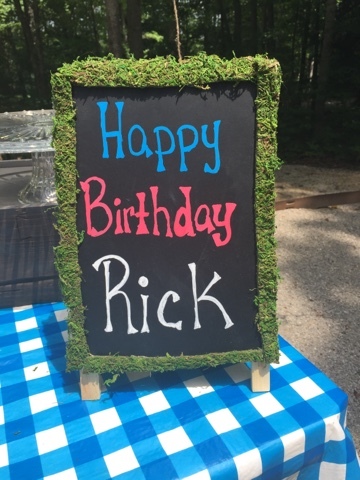 I chose a day to have my entire family out to the campsite for the big dual birthday party. I decided on having a S'more theme. What better theme goes good in a campsite and around a camp fire? I love seeing the campsite lite up with all the lights. It is much easier than having lanterns all around. 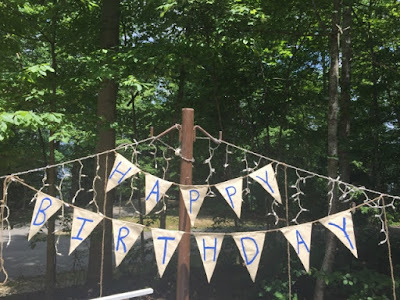 I made the banner by hand. 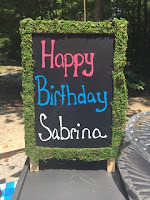 All you need is fabric, jute, and blue paint. 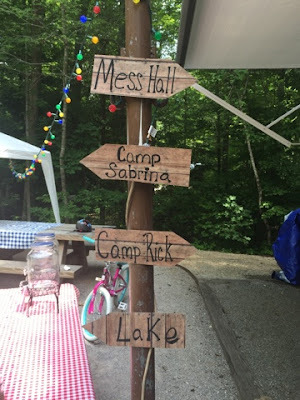 I really thought the colors of the fabric and the letters gave it that rustic camping feel. You can't get a better background than the lake and trees. I loved the signs. These were made from scrapbook paper. 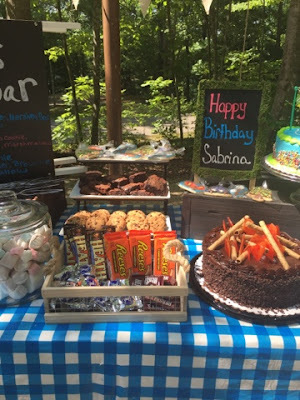 This was the S'mores bar and dessert table. I served a variety of candy for the s'mores. I also served camp theme sugar cookies, brownies, chocolate chip cookies and cake. I will give you a tip about the candy. Freeze the candy bars before you set them out. If it is a hot day the chocolate will melt within minutes. I had my table all set up when my guest arrived, but then I took the candy and placed it in the freezer while we ate dinner. Then when it was time for s'mores, I brought the candy back out. 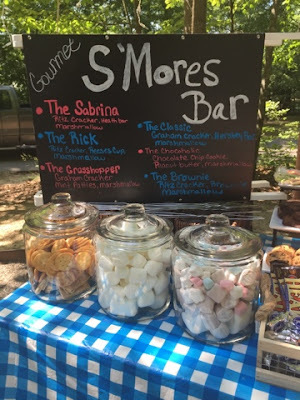 We had a Gourmet S'Mores Bar. I offered 6 different type of s'mores. 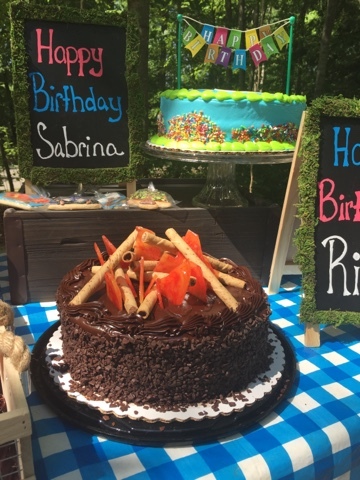 Two of the s'mores were named after the birthday boy and girl and it included their favorite candy bar. I offered different flavored marshmallows, graham crackers and ritz crackers. 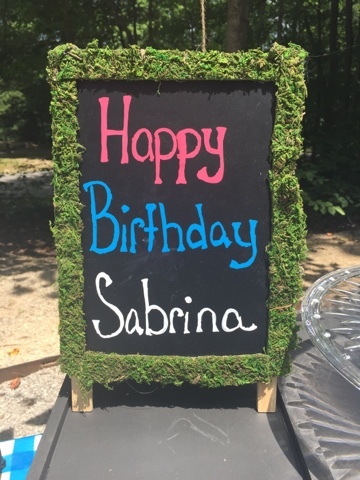 I decorated two chalk boards with moss to give it that woodsy feel. I thought each of them needed a special touch to accent their birthday. I loved the cakes. I cheated and bought them at Sam's Club. The only thing I had to do was add the fire on the chocolate fudge cake. The blue cake came with the cute banner. 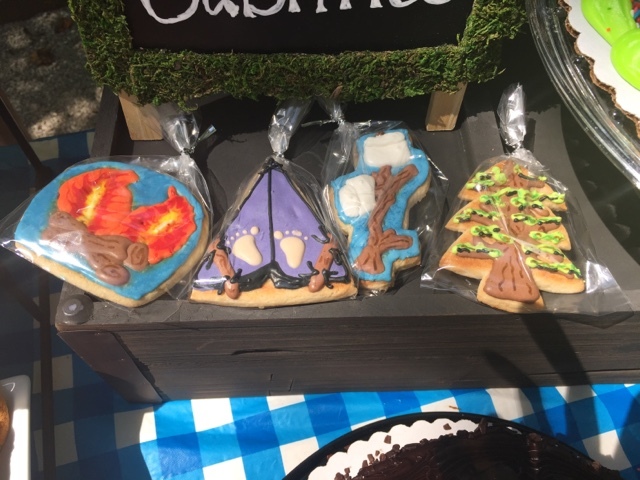 I ordered these adorable camping cookies from Boom Cookies. I sent the cookies home with my guests as party favors. I sereved lake water and sunny aide as drinks. 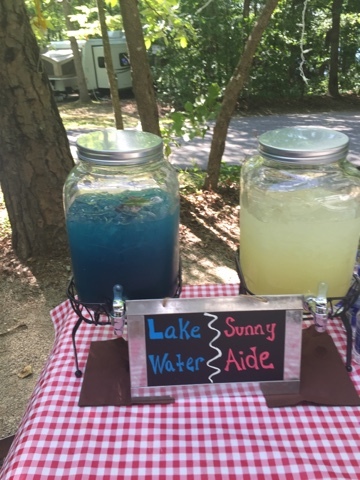 I had placed Swedish fish in the lake water thinking they were going to float. Well they sunk. The kids enjoyed them. We had a wonderful weekend. 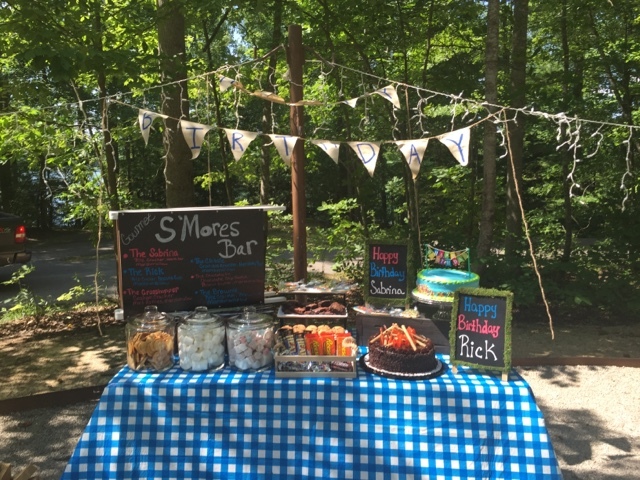 Overall I think the S'mores Bar was a hit. I learned that a ritz cacker is 10X's better than a graham cracker and anything goes with a marshmallow. Don't be scared to try anything. The most favorite s'more at our party was a creation that was not on the menu, it was a brownie, white marshmallow and a reese's cup in between ritz crackers. What is your favorite S'more? Have you ever hosted a S'mores Bar? If so, what did you serve?